Recent benchmarks? Oh, there are so many to choose among. 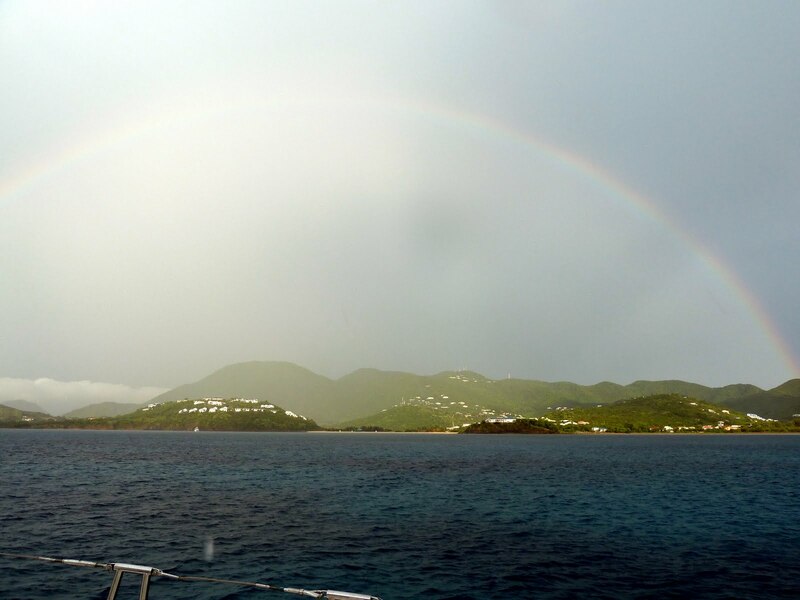 The rainbow portal and the light thunderstorm that followed us on our first boat -on-water-day sailing from the launch at Geminga Yard to our «home» Grand Case stands out as a very special experience. Handing my apparently unsellable RangeRover -96 over to the new (grown up, facing his destiny with every warning taken and open eyes) owner at Molde Airport 40 minutes before departure was for me another manifestation of coherent powers that seem to support the YumYum walkabout. Our current project is to travel south out of the hurricane area down to Grenada. We do not feel that we need to run away from immediate danger. But of cause, we are watching the forecasts closely, and are ready to move very fast if necessary. The tax free superyacht service equipped St. Martin turned out a very good place to fix many of our “superyacht” preparations too. 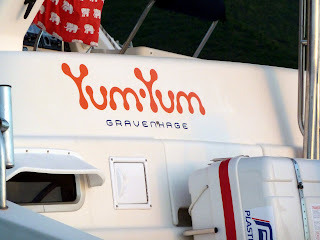 We left three days ago, two weeks later than initial schedule, equipped with diving gear, washing machine, SSB-radio, overhauled genoa, and a lot of other goodies from our wish list. I have just finished a 10 day antibiotic prescribed by Dr. Camicas. The Dr is a dedicated acoustics expert, an fancied our common interest much more than my clogged ears and mid-ear infection. But I left his office with an impressive prescription / shopping-list for the pharmacy. In the mean time, Valentine had great success checking out at the local customs. A minor detail being that our departure date the following day gradually lost contact with reality as days on St Martin passed by. When we finally got to the immigration on St Barth (about three hours sailing distance) ten days later, I must admit my knees was shaking a little. Being the responsible Captain in the papers and all. Luckily it turned out the toothbrush I had prepared for use in the dungeons was a waste. The very helpful customer put all his attention towards introducing us to the self-service computer terminals, not even looking in the direction of our passports and emigration dates. It seems to be a pattern that things turns out to be more easy going than what we expect. We are slowly (everything in the Caribbean seems to be a little slow, now, believe it or not, even the two of us) gaining experience about the boat and the conditions surrounding us. Snorkeling and diving is really great more or less everywhere. The boat sails well, better and better as our skills improve. Today we found out that in 15 knots of wind on the nose we could sail pretty well (7-8 knots SOG) with no more than 120 degrees COG unsailable sector against the wind. Meaning that this catamaran actually can sail against the wind! Sort of..